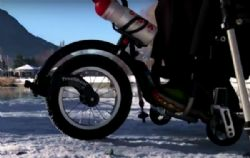 With the FreeWheel your wheelchair castors are lifted off the ground, turning your chair into a 3-wheeler, so you simply roll over any obstacle: curbs, dirt trails, grass, gravel, snow, and sand. No more wasting energy and slowing down to pop a wheelie. For individuals with folding wheelchairs, you will need the ADAPTOR to connect your FreeWheel.